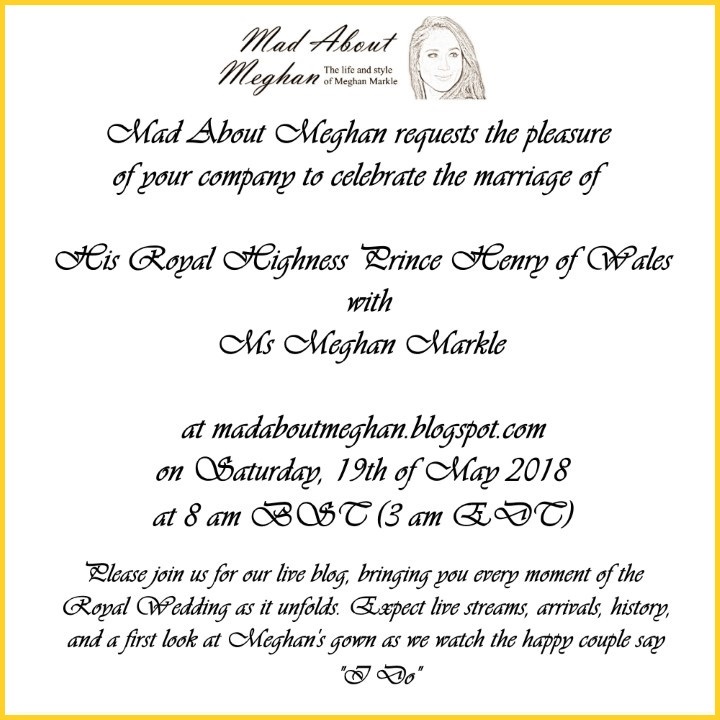 Mad About Meghan: Your (Mad About Meghan) Royal Wedding Invite! Your (Mad About Meghan) Royal Wedding Invite! Are there links so we can watch it live one-line? Yes please, a live blog for Friday would be perfect. I am taking Friday and Monday off to make sure I capture every tiny detail! Super idea re Friday coverage; FYI, BBC & all Canadian Broadcasting Networks will be covering Saturday’s events as well as special programming in the next ten days. Interested persons can google “Royal Wedding coverage “. What a great idea, Charlotte; thank you! Looking forward to joining you on the live blog here in New England! I am so happy and lucky to have found this perfect blog! I will join all of you of course! I am so excited and I am looking forward to Harry and Meghan's wedding! I started reading this blog way before the engagement last year, even before Harry made the famous statement. I used to go to other sites before Harry met Meghan but those sites were fair to other royal members but were mean to Meghan, so I decided to follow this one, happy to find you Charlotte and yes I accept your invitation! My husband and I will be watching this wonderful celebration together. My sister promised to join with and she will make an English Breakfast with eggs, sausage, baked beans, grilled tomato and some fruit, I can not wait!! Charlotte you are amazing! I was hoping you would have a live feed for the wedding so, well done, but the possibility of keeping us up to date the day before also?!! I'll be thrilled with anything you provide, just please don't burn yourself out! Mary from Nashville Tennessee joyfully accepts your invitation. Thank you, Charlotte. It will be a very early morning for me on Pacific Daylight Time; however, I look forward to the day and your contribution to it. I am in love with the Royal Family and can not wait for the Wedding. Whatever you do will be read and watched with great enjoyment! But, Charlotte, pleas get plenty of rest before the 19th!!! Thanks for this delightful blog! Yes, pl. a coverage of the day before with maybe even a live blog. Oh, heavens, that's 2 am my time! I've done it before, for Diana and Fergie and William, and probably I will again. It is all so interesting once I am up and awake. Or maybe I'll just stay up. . . I am RSVPing yes :) Would love to follow the coverage in the days before, as well. My friend and I are already planning our sleepover to catch the coverage bright and early on the American East Coast. Many, many thanks for all you do Charlotte. Your blogs are always a bright spot in my day. Charlotte, I accept your invitation. Thank you for doing a live blog for the wedding. It will be in the middle of the night my time, but I'll be wide awake and excited (and probably drinking strong coffee!) Your Kate and Meghan blogs are the most reliable for all the news. Thank you for a job well done. I'm so excited and can't wait. Yay! Delighted to accept your lovey invitation, Charlotte! :) What a fun way to lead into the next couple of weeks of wedding festivities! And yes, please! to the additional live blog on Friday!!! :) As long as it's not too much for you to juggle! OOOOH I CAN NOT WAIT!!! I would love to see an extra day of the upcoming wedding if thats not too much work. Would like to say an advanced thank-you for all the hard work you will be doing so we can enjoy the day as well. I would love day-before coverage--any and all coverage! LOL Thanks for bringing us such great info and photos--you are the BEST! How clever, fun, thoughtful and sweet. I will be here and would love to follow along on Friday but please, take time to enjoy it yourself. You are so wonderful to us - you deserve to enjoy the celebration as well! I would love extra coverage! Thanks for your amazing posts and photos! Are you KIDDING? Bring it on! Charlotte, did you really expect anyone to turn down more coverage? Oh Charlotte, thank you a thousand times for doing this!!! Like the other folks here on the blog, I hope you won’t get worn out and that you’ll enjoy all the festivities too! I have to calculate what time I have to be up across the pond here in Nova Scotia - am thinking around 4 am if EST is 3 am. I’ve been saving a special bottle of wine for this occasion! I just have to make sure I recover from it in time to play the organ at church the following morning. I don’t think it would be appreciated if I did a face-plant on the keyboards during the service! 🌸 Becca.🤨 wherever that production studio is. We say, “Cut.🎬 And that’s a wrap.” And ask you to come and join the fun. It’s only 12 days away Becca. My dear Charlotte, Ms. Cuppa accepts with pleasure your kind invitation to the Live Blog of the Royal Wedding between HRH Prince Harry to Ms. Meghan Markle. I'll be wearing pjs and my finest hat! Ms. Cuppa, I love your reply! Thank you so much. I am already setting my alarm and will be at the ready leaning against my pillows in great anticipation. My calendar will have no appointments except the words "Mad About Meghan". Thank you, Charlotte! I'd love a live blog the day before!! I think we are all excited to share this together and I just know there will be plenty going on the day before, too. Can't wait! I live in Virginia, so not planning to join in at 3:00, but I am rising very early (for me) on the Saturday, and I accept with pleasure your kind invitation. US television is coming on at 9:00 BST, I hear. Meghan is my sorority sister, I’ve just heard. Kappa love to her! Can't wait to follow along with you. It's a perfect way to celebrate my birthday!! 🌸 uh. wow. The 18th will be my birthday also. Your invitation card is not only thoughtful and beautiful; it looks like the original the couple sent out. it also looks forward, by a positive twist of your care, to alter the bad mood, which goes up and down with one story or another out there in cyber space. My response even w/o RSVP requested - would have been a yes punctually, if it was two weeks ago. Only last week, did I find out I have to work on the 19th. I will miss my most favorite part of the event; the suspense of following the day from the morning until its completion. I will miss your posts and comments as events unfold, and the input of commenters. Well, I will be here by 6:00pm EST on May 19, God willing. By then, you may be having your well-deserved rest, about 10:00pm, UK time. I admit to have watched Kate’s entry into the Abbey and her walk-in the aisle, one too many times. It remains one of my top most favorite scenes. I hope there will be a memorable “magically immortal” moment from this wedding too. I was happy to have watched W&K’s wedding day from the very beginning, arrival of the guests, and especially the jubilant mood of the people waiting for the day, the groom and bride. If I remember correctly, the sun came out when she arrived at West Minister Abbey. May 20th, this blog will have a different name; the “Mad about Meghan” will change to…? Little did you know? In fact, you were ahead of it all, when many doubted. While it will be a new chapter forward, I will kind of miss the suspense which unfolded as “Mad About Meghan” blog. The constant insight of Eve-Germany and Surfer Girl who actively advocated on this blog for Meghan had been a lesson in optimism, intuition and consistency. Mr. D from UK, bluhare, Claudia and royal fun are all memorable. It had been one fun and informative ride while it sorted the many factors of society in the past and present. No one knows about the future; just hope it will be all good, and those who saw the good will hopefully find it all to be so. Best Wishes to all of you, this blog, the couple and the new future title of the blog. Well said, Anon15! I wasn't here from the beginning, and thus enjoyed your recap. I hope and pray, too, that Harry and Meghan will be able to cherish their love in the years to come, build on it and find happiness and, in difficult times, strength to come through them, maybe even stronger than before! Eve from Germany, I know what you mean. It felt different from the very beginning. I knew it when I saw the matching bracelets, hers on instagram, his in photos. I hope and pray for the best for you Eve. You take great care of yourself. Thank you for your beautiful post. Thanks Anon15 for your lovely words. This blog has been a joy to follow, and comment in right from the beginning and share in the anticipation and excitement of this incredible partnership with you all. Eve, SG and other regulars - thanks for all your enjoyable commentary - long may this continue, it's been great getting to know and share with you - big hug to you everyone x. Sorry for the delayed response. The week-end has arrived; I wish you all a very nice one. Thank you. I could not resist to look back especially considering where it is at now. I was not here when DKB started either. I arrived at DKB blog from a link which web address was something like britishroyals.uk. DKB was one of the links they provided. It was sometime in 2013, gradually continued here as Anonymous, and January 2015, joined as 15. You are welcome. Please continue to inspire more than you may not know; people read, and may not comment. The good and the bad in life, is part of being a human being. To be capable of knowing where one’s life is, admit it, and yet find joy from others happiness is another lesson to learn for some in this world. You have arrived in good form. It was as much interesting following your enthusiasm, optimism and comments, as keeping up with this couple’s relationship on this blog. You are missed on DKB. That blog has its own life too, which can lead into a different kind of discussion and information. You are missed there. I hope you will reconsider. You are welcome. It is so nice and special to find your current comment while you are traveling and working in a different country. It is interesting to know how another part of the world perceives the wedding from a familiar MAM & DKB commenter. Hello SG- I hope you are ready for the party. You deserve a special honor as the wedding party planner of MAM. One more week to go-see you all next Saturday. Stay well and good. I hope you are reminded that it is a matter of time, make reasonable patience your friend until the right time and/or place happens. I have some obstacles in my way, as well as some good. Over the years, I learnt to be grateful for the good, and try working at solving the problems. Sometimes it feels forever, one can only carry on with the good before the bad affects other areas of life, and gets worse. I am sure you continue at the effort to solve the issue and make what you want happen rightfully. In truth, it is bad health which is the worst challenge in a person's life OR bad influence which results in bad health. It is good to know you continue to choose happiness while you are working on the challenges of life's routine. I don’t mean to minimize housing as routine as it is one of the most important parts of life, but millions of people sort out their housing issues every day as part of living. Your week has arrived! and enjoy it, as positive as you are. May it be a bright month and year in all aspects of your life, with a blessing from God. Charlotte, I accept your invitation with pleasure. :) Coverage on Friday would be wonderful but as others have stated, please don't burn yourself out. You deserve to enjoy this special event too. Thank you so much for everything you do!!! Extra coverage would be amazing! Yes, please to the day before love blog! You are amazing. I’ve been following your Kate blog ever since you started it- so your Meghan blog has been such a nice bonus!! Thank you for you hard work and kind reporting. I would like to RSVP with a Yes! for one from my place! I am planning on serving scones with a hint of lemon and elderflowers (if I can find them). I’m on the west coast of the US, so the time is going to be a challenge, but I’ll be watching and I’ll be here! Thanks for the coverage! What lovely ideas. Thank you for the invitation! We are going to have a small party with friends in Pretoria - will hopefully follow your blog and tv at the same time! I surely will be there! I haven't followed your sites for a long time, but I'm already in love with them. They are a good company for me during the day. A live blog is a wonderful idea and it demonstrates how generous you are. The 19th I will prepare a nicde english breakfast and let's start! Greetings from Tuscany, Italy. We at my house will enjoy whatever you do, Charlotte. Thank you so much! I am rsvp'ing yes. but could you please explain what BST is so I can work out the time difference? Charlotte, thank you for the lovely invitation which is wholeheartedly accepted! :) Can't imagine being in a better company. As for the day-before coverage - Yes, Please! I also join the others who have said: please make sure to get plenty of rest in advance .... and afterwards! Yes please to an extra day of coverage. How extraordinarily generous of you giving of your time in this way. Thank you! Yes, please. How very generous you are with your time. Thank you! Thank you for the invitation. I hope to watch the movie based on H&M this coming weekend. Life time or Hallmark will be releasing it on May 13th. I wish you and this community a nice week. Dear Charlotte, you deserve a wedding invitation,maybe as a reporter inside the grounds of Winsor Castle ..😊As a thank you for all your hard work and positive coverage of the BRF.I am so looking forward to your upcoming posts! 🌸 wow. good point, Heather. It is amazing. I say YES! to the day before live blog! So exciting! Thank you so much, Charlotte. All that you do for this blog and our community is greatly appreciated!! Thank you very much for this lovely invitation, dear Charlotte, I will definitely join the party. Having your guidance throughout the day before the wedding will be equally terrific. Your live coverage will add so much fun and background information to perfectly round up a royal wedding. Charlotte, I've been wondering if you will be changing the name of this blog once Meghan becomes Duchess (or princess, or whatever he title will be), i.e...."hrhduchessmeghan.blogspot." I understand if you don't, as this has been an established blog for a year now. However, I feel the current title won't show the same respect to Meghan's position as does the title for Kate's blog. I think that's important because I have a feeling she won't get the respect (from the public in general) that she will deserve. I'm giving it serious consideration. Initially, Mad About Meghan was only a short-term name, since then it's really grown on me. Changing it could prove quite challenging logistically and in the days after the wedding I expect a number of sites with Meghan's title to pop up and I worry it would be very difficult for people to find this space and associated social media accounts. On the other hand, I completely understand your points. I'll continue to think it over for the next week or two. Mad About Meghan or Duchess Meghan? What do you all think? IF ITS NOT BROKEN DON'T FIX IT! Love title Mad About Meghan because we are. A title before your name doesn't earn respect. It is the person that you are inside and how you project to others on the outside. Our girl is perfect for the role! I'm all for Mad About Meghan. Mad About Meghan has grown on me, too. I think it's appropriate considering the reaction of the crowds as Meghan and Harry toured the country. No matter what title she is given by the queen, people will always be mad about Meghan. She will be royal by marriage, have the official title and will have to follow certain rules, but Mad About Meghan suggests another side of her, her down-to-earth approachability, and kindness. Kate, being the future queen, might need a more formal blog title, but I hope you keep Mad About Meghan. How about “ mad about duchess Meghan” i think it’s a unique title and people probably won’t have trouble finding it. Duchess or not, like USA Granny said. Let's keep it the same! Anyhow, she might only be a Countess, like Sophie. Thanks for all your good work, Charlotte, it is always a pleasure to be here. Keep the same title with her wedding photo like you do with DK blog. Also trademark it if you can so other publications can't use MAM without your permission. It is a fun title. I know - how about changing the Kate blog to "Krazy about Kate?!" LOL!! Charlotte, it is a dilemma that only you can decide as there are many factors none of us can weigh in on. If you change the URL - then you'll have to pay for two domain names and have to set up a redirect, it could impact your search standings, etc. What I believe you should know is that none of your audience will leave. You are greatly admired and respected for your thoughtful and informative postings. Looking forward to following your blog on the wedding day. I would also enjoy you doing a blog the day before the wedding!! 🌸 that reminds me. Paola. Where are you? I miss you.😊 Surely you are going to join us for the Royal Wedding. Yes? 🌸 Charlotte. Like many others here, I am truly in awe of what a loving International, Worldwide community has been created through your most excellent blogs. It is amazing. An immense blessing. Immense. Your work is most appreciated Charlotte! I Have been quietly following along since day 1 of this blog and I will be here for any, and all, of the wedding festivities! Charlotte you have created two very unique places, about 2 very different women, where the caliber of quality information and level of kindness are second to none. Thank you so much for these fun, safe places to indulge royalists from around the world! Love the title “Mad About Meghan!” Hope you will keep it, as we all will still feel the same way about Meghan. I think it was an inspired title! I'm in this blog since a very little time and I like it because everybody comments with kindness and civility. This is very special. Maybe I shouln't give an opinion about the site name because of my short permanency in it, but I think Mad about Meghan is very appropriate before and after the wedding. It sounds nice and marks a difference with the site dedicated to Kate and her family. Jo, that's great! I wish we could see you all... :) Have fun! Mad about Duchess Meghan sounds great keeping with your same theme. I echo all the accolades. And thank you for invitation to the wedding celebrations. It will be crazy day with a lot of beautiful and touching moments.Probably I won 't fall behind with you,Charlotte but I can 't wait for 19 th! I really like this idea, mari vale! We will be here, it's going to be a fantastic day! I gratefully accept your invitation. SO looking forward to this!! When Vanity Fair came up with a cover of Meghan, titled “Wild about Harry”, it was several weeks after you started the blog, “Mad About Meghan”. I thought, VF came up with a reflection of your blog for Harry’s version. MAM is a prelude and a chapter all on its own, not only a man mad about a woman, but the world was stirred in amazement, and a different kind of madness had been going on too. IMHO, may be archiving MAM as an archive accessible under the future blog name may work. You have been known for over seven years as a DKB blogger, and to have a “twin blog” of similar / compatible title will ease people into the alternate universe, while be mindful of the brothers spouses, though different, also as team members of “the fab four”. If Meghan was to become a duchess, then the sister blog will be DMB. Like you stated, many blogs with Meghan name will pop up; it may be better to maintain the consistency of what you have been known for, as a DKB blogger. It will also be post the madness, entering into the challenges of marriage, duty, possibly family, the known and the unknown future. I hope you will go for the DMB, or whatever titles the Queen will bestow on the couple. I hope everything of MAM will continue to be available as a pre marriage history on your blog. Regardless, your very own judgement is most reliable. Thank you for the offer to sort out what had been, and what will be. Stay good and well! Long time ago, someone asked you, what this blog will be titled after they marry. If I remember correctly, you favored naming it, HRH Duchess Meghan Blog. This is the sweetest thing. Thank you Charlotte, and yes I vote for the day before live blog too. Hi! I followed on Twitter! I really want those sunnies! Can't wait for the Royal Wedding. Looking fwd to join your live blog on that day. I can´t wait either, Faiza! Hugs from Germany! Looking so forward to it! I will be up at 3 am. CT in the United States just like I was to watch Charles and Diana and William and Kate. If you do feel you should rename the blog, perhaps "Mad About Meghan" could be the subtitle. Meghan has a sort of theatrical life, of her choosing, so this original title would be suitable. this journey such fun. 6 days and counting.